Were Burned L.A. Dogs Victims of the Sun, Not Abusers? i Still Love Dogs > News > Were Burned L.A. Dogs Victims of the Sun, Not Abusers? burned dogs, dog abuse, Fergus, L.A. County Sheriff's Dept. Since July, at least eight dogs have been found in northeast Los Angeles County and neighboring Kern County with severe burns down the middle of their backs. Most recently, a Chihuahua puppy with what appeared to be chemical burns was found in Boyle Heights on Oct. 8. This was the first known attack on a dog in the City of Los Angeles. A reward that’s increased to $50,000 has been offered for information leading to the conviction of the abuser(s). But the initial findings in a controversial report by the Los Angeles County Sheriff’s Department conclude it wasn’t a person who burned the dogs with some kind of chemical — in almost all cases, the abuser was the sun. “Both animal forensic experts and veterinary experts formed the opinion the dogs were not intentionally burnt, but suffering from burns caused by the sun, solar thermal necrosis,” the LACSD said in a statement, KNBC reports. Investigators looked at 10 cases. Nine of the dogs had been discovered with burns during the past three months. Only one dog, a Cavalier King Charles Spaniel found back in 2012, had suffered chemical burns, according to the report. 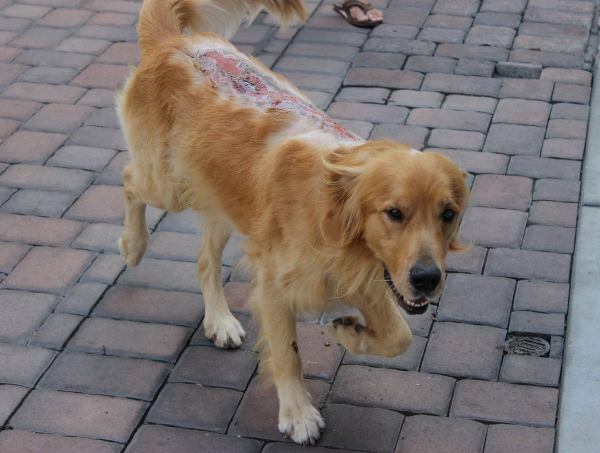 One of the nine dogs was Fergus, a stray Golden Retriever found burned in Lancaster two months ago. He has recovered from his injury and was adopted this week. His veterinarian, Dr. Alan Schulman, was shocked with the LACSD’s findings, and sticks by his original diagnosis of an acid burn. L.A. County Supervisor Michael D. Antonovich told KNBC he is very concerned about the welfare of dogs. He said that as the LACSD investigation continues, the $50,000 reward is still being offered. Anyone with information is asked to call L.A. County Sheriff’s Deputy Daniel Gore at 661-940-3851 or the L.A. County Department of Animal Care and Control at 661-974-8096.